Four-socket Hubbell light paired with a large flat white shade. Harvey Hubbell II was known for his innovative electrical products and was granted dozens during the early 20th century. 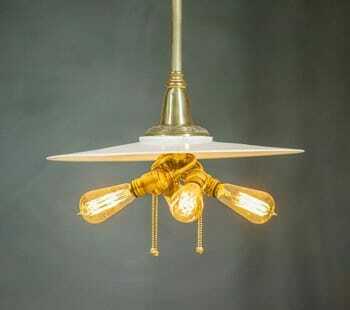 One of his most groundbreaking contributions to the lighting industry was the pull chain, which allowed bulbs to be easily turned on and off. His invention created a safe alternative to the gas lamps that were prevalent in homes and businesses.